Spring is in the air and gardens everywhere still hold the magical promise of the perfect season ahead. I have carefully selected the seeds and made the plan for my own little parcel of paradise. There will be the prerequisite assortment of our favorite vegetables, flowers, herbs and fruits for the picking throughout the coming months. This year is the tenth anniversary of the garden. I am not sure where the time has gone, but I can say with certainty that I have learned a thing or two along the way. 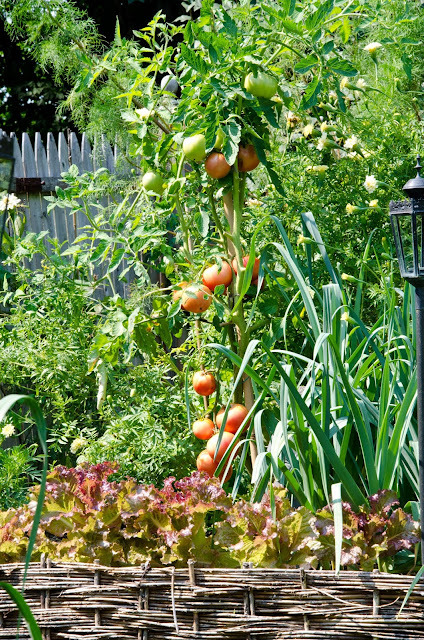 One of the most important lessons I picked up is that the beauty and abundance of the garden is a direct correlation to the quality of the seeds and plants planted. In others words: start with the best and you end up with the best. There have been times that on impulse or from laziness I just picked up a pack of seeds off the rack along the way. There is one company that seems to have racks just about everywhere I turn that drives me to distraction and the depths of remorse long after I can fix the problem. Case in point, last summer I needed some extra zinnia seeds. Instead of ordering them online from one of my favorite companies, I opted to save the postage and pick them up at the super market. The package promised a glorious mix of shades of pink. The "glorious mix" turned out to be fire engine red. Red is not pink nor was it a glorious shade. So, to save others from a similar fate, I am sharing my 4 favorite sources for seeds that I have have ordered from time and time again without worry. Happy gardening! The garden in late spring already has a variety of lettuces and roses ready to be picked. For flower seeds I rely on the great assortment at Baker Creek Heirloom Seeds. The depth of variety is fantastic and the print catalog is a work of art each year. I got my first and happily only packet of scented tabacco there. I say only because it has become a welcome invasive plant in the garden because it reseeds everywhere. In addition everything they sell is heirloom, no GMO's here. Order early, I have been surprised by out of stock notices more than once. 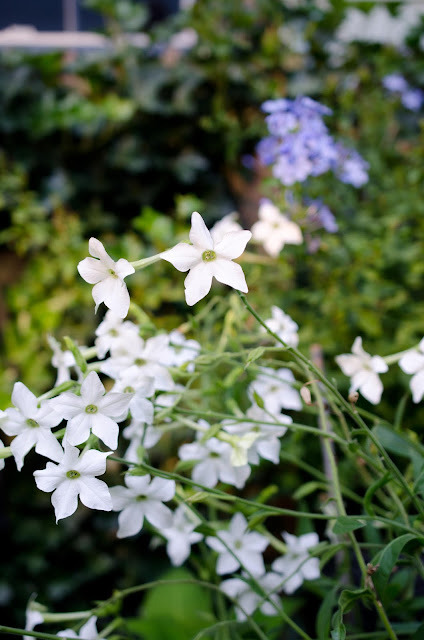 A must - the white flowers of scented tobacco fill the garden with a heavenly fragrance each summer. Pomme de terres are a favorite food group in our house. I always turn to John Scheepers Kitchen Garden Seeds for their Bintje Dutch Potato tubers, it is by far our favorite potato. Of all the many things I have tried from this company I haven't a single complaint. They have never disappointed me. 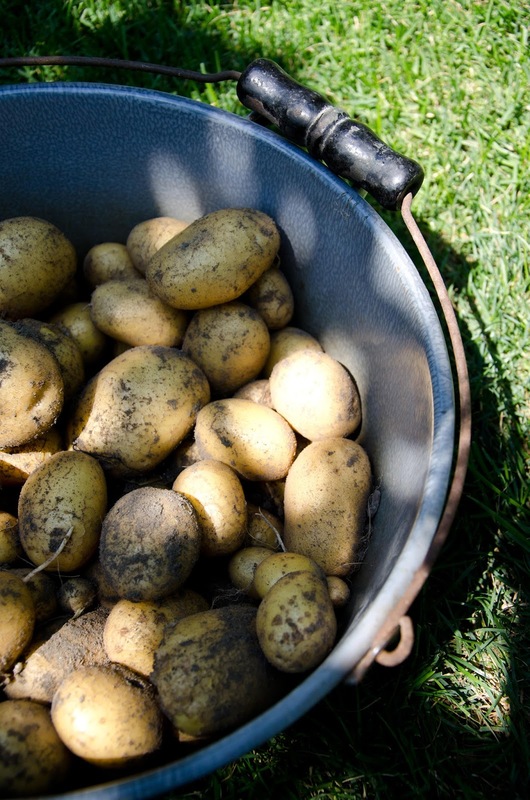 These potaoes par boiled and tossed with butter and summer savory make a great side dish. The cool thing about Territorial seeds is that it is a seed company geared to four season gardening. Clearly with a garden in the northeast that is a challenge. 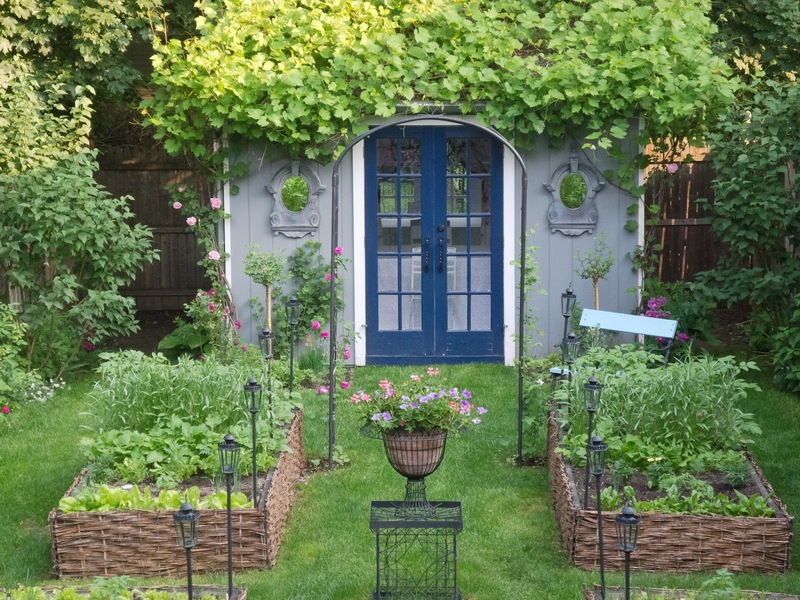 However, the varieties they sell have a long range of season which helps maximize what I can grow in my small garden. 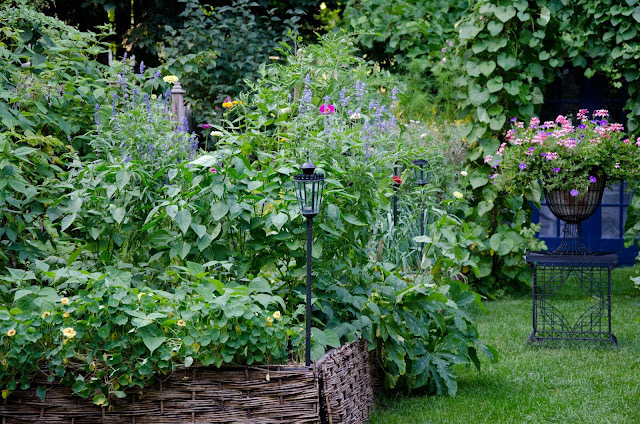 The garden mid summer: a wealth of abundance with the air of a jungle. Gourmet Seeds is a company that also offers a great range of varieties but it also sells the Bavicchi seeds from Italy which I really like. The salad greens and range of peas and beans is really great. They, like the other three seed companies that I like are heirloom driven and and do not use GMO or treated seeds. Tomatoes ripen in the sun alongside leeks, lettuce and white marigolds in the background. My idea of garden happiness.